There are process knitters and there are end-product knitters. Regardless of which group you feel you belong to, it can be tiring staring at an ill-laid-out pattern for the hours and hours you spend knitting a project. 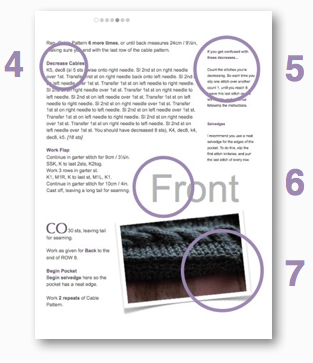 Without proper section titles, spacing, and use of visual aids, the lines of a written pattern are hard to keep track of and you can spend more of your time trying to figure out where you left off than actually knitting! Charts that are all black and white and insufficiently labelled can be an even bigger nightmare. That’s why I’ve spent a lot of time and effort laying out Laylock patterns to be fun to look at as well as to follow. 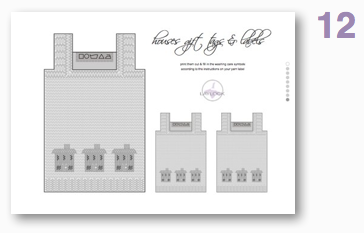 I want you to enjoy the experience of reading & executing the instructions as much as you enjoy the final piece. 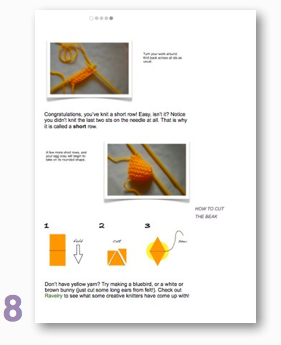 If you’re a beginner knitter, it’s even more important that you’re not discouraged by confusing directions and unfamiliar techniques. Imagine your pattern, not as a set of static sheets, but as a map to get you where you want to go. Which pattern would you prefer to follow? 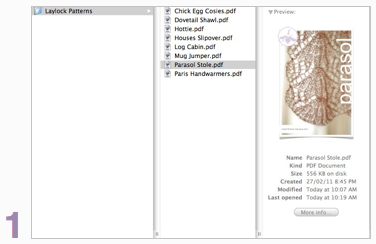 1 The front cover of every pattern features a large photo & title, making it easy to spot on your computer, and in your Ravelry library. 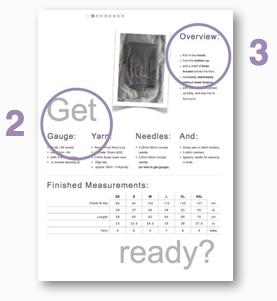 2 The first page neatly lists all information you need to prepare to knit. Measurements are in both metric and imperial. 3 Know what you’re doing before you start. Is the pattern knit flat or in the round? What is the order of working? The overview will tell you. 4 Divisions are typographically hierarchic to direct the eye, and make sequence & importance clear at a glance. 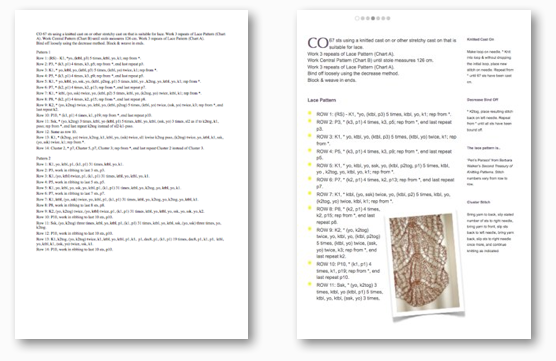 5 The sidebar has supplementary information such as explanations of special stitches, techniques, and helpful tips. What you need, where you need it, without disrupting the main flow of the pattern. 6 Large visual cues add interest, and help you remember where you left off. 7 Clear, detailed photos guide you and provide extra colour & interest. 8 Where unusual techniques need to be described, some patterns include step-by-step illustrated tutorials, or provide links to online video and photo content. 9 You can track your progress through the pattern with the progress bar at the top of every page. 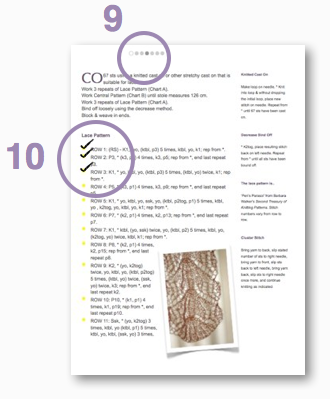 10 You can use the large bullet points to tick off progress when you’re working a complicated stitch pattern. 11 Where needed, clear, colourful charts are provided in addition to written instructions. 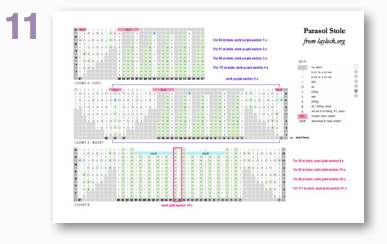 The charts are intuitively designed, and easy to follow both on screen and when printed. 12 As if all that wasn’t enough, some patterns even include extra gifts, such as these matching gift tags with garment care symbols. Click here to download a few, and see for yourself!